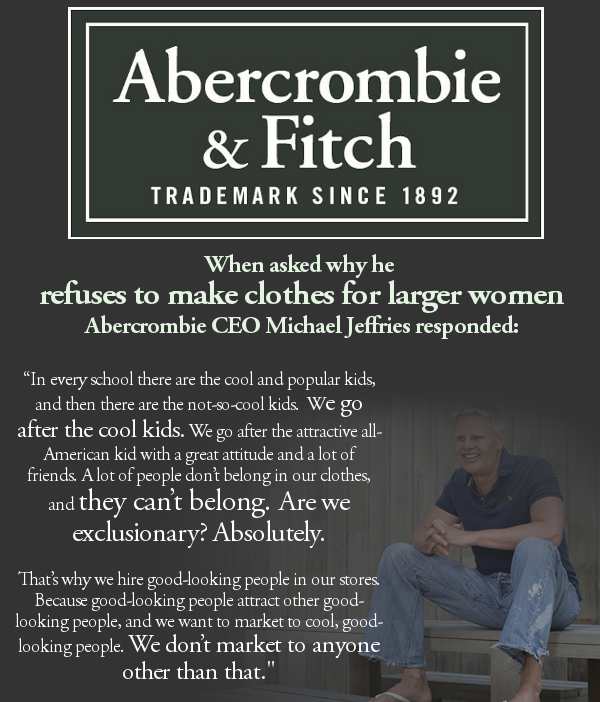 Sometimes it seems as if Abercrombie and Fitch exists purely so that people can hate them. In fact, it seems as if people will never tire of hating Abercrombie and Fitch, as evidenced by the fact that I received TWO “Abercrombie is awful” listicles in the past week. The first list features some of the more tried-and-true reasons to dislike A&F: they’re racist, discriminate against employees with disabilities, and pollute the mall with clouds of their cologne. The second list took a slightly different approach, noting that even a job in A&F’s headquarters is plagued with a focus on appearance and color-based dress code. These recent lists made me think about the last time Abercrombie got their name in the news (or at least on the internet); a graphic featuring a picture and quote from CEO Mike Jeffries was widely circulated on Facebook and tumblr, and people expressed outrage at the blatant prejudice that Jeffries showed against the unskinny and uncool. One of the awesome things about the internet is that ridiculous stuff like that can be widely circulated, to make people aware of its existence and to be able to take some kind of action against it. But what I want to talk about in this post is the importance of making sure that the responses or action taken against such ridiculousness doesn’t fall into the same pitfalls that the original ridiculousness did. After the Jeffries quote made the rounds, several people sent me a link to a video titled “Abercrombie and Fitch gets a brand readjustment.” In the video, creator Greg Karber laments A&F’s decision to destroy extra stock instead of donating it to people in need, and suggests that we collect used A&F clothing and distribute it to homeless people as a ways to dilute the A&F “cool kids” brand, sharing our activities under the hashtag #Fitchthehomeless. While I agree that the amount of waste inherent in brands’ policies regarding unsold clothing is a problem that needs to be addressed, the video left a bad taste in my mouth. See, the whole “gotcha” tone of the video is dependent on the same premise that Jeffries made in his statement: that certain people are worth less than others. Karber thinks it’s funny that he’s diluting Jeffries’ brand by giving A&F clothing to homeless people, but he seems to ignore the fact that by doing so, he’s basically saying that homeless people are worth less than the “cool kids” that Jeffries adores. He’s setting up a very clear line between “us” and “them,” in which the homeless people are not treated as individuals, but as nameless props. Part of my distaste for Karber’s stunt was personal. I used to volunteer with homeless youth in New York. The kids I worked with were not at the stage of homelessness as the people on Skid Row. Few were regularly sleeping on the streets; they could often stay at the shelter or sleep on a friend’s couch. They did not display the potential mental health issues or addiction issues that are associated with people on Skid Row, but were just having a hard time staying on their feet. Many of these kids were very image-conscious; when we received clothing donations, recognizable brands like A&F were quickly snatched up. They responded positively when they were seen as individuals and treated as if they deserved respect. These kids did not want to be viewed as nameless, faceless “homeless people,” as Karber treats the people in his video. They wanted to be treated with dignity. The suggestion that their wearing of these brands would have diluted them would have been insulting and hurtful. While Karber obviously went into creating his video with good intentions, the major error that he made was that he conflated two very different problems: A&F’s wasteful policy of destroying unsold clothing, (a policy shared by other brands), and Jeffries’ statement about the ideal A&F consumer. The issue of A&F’s wastefulness would be more appropriately addressed with a straightforward focus on righting a wrong; however, people’s outrage at Jeffries’ statement evokes much more of a “screw you, A&F” response. Karber addressed the first issue with the tone with which you’d address the latter. The punchline of his video is pretty much “haha, isn’t it funny that homeless people are wearing A&F?”. His childish question “where is, like, the douchebag section?” reinforces his “screw you” tone, as does the dismissive way with which he treats the homeless people in the video. To him, they are props, and he treats them similarly to the way that Jeffries treats the “uncool” people who are too large to wear Abercrombie’s clothing. So, if the video helps to raise awareness of the issues surrounding A&F’s policies, fine. But let’s see their discriminatory branding strategies and their policies on unused clothing as separate issues, and treat them as such. ← Do feminists make bad moms?